The "earth" does not signify the physical earth - spiritually the "earth" signifies the church on earth which is conjoined with God's kingdom in heaven. Thus in the spiritual sense, the kingdoms of the "earth" in prophecy do not signify literal kingdoms, but different states of the Christian church. The complete and true restoration of the Christian Church is accomplished at the end by a final judgment and heavenly revelation which is known as the "Second Coming." The Second Coming is not a literal Second Coming from the sky, but a spiritual revelation that restores Christianity. 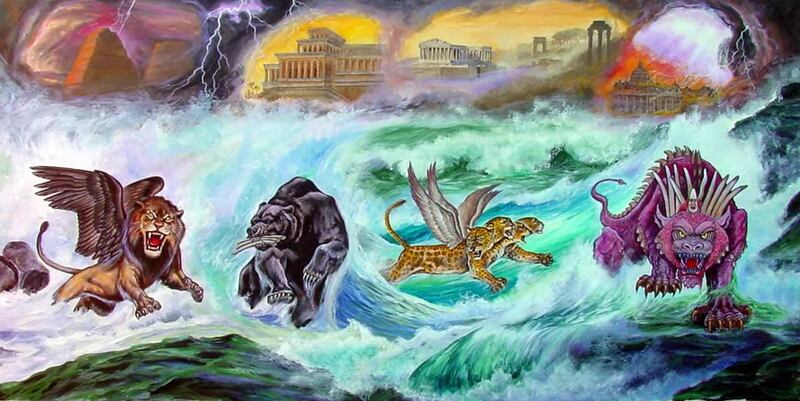 This is described in the blog post Is the Second Coming a Physical Event or Spiritual Event?. This revelation of the Second Coming was given in waking visions to Emanuel Swedenborg in the 18th century, who revealed the spiritual meaning of the prophecies of Daniel and the Apocalypse. After the Roman Empire, there are two schools of thought: the historicist, which assigns the little horn to the Papacy that arose out of the Roman Empire, or the futurist, which always assigns end times to an unspecified future, but always future. So I will be like a lion to them; I will lurk like a leopard on the path. I will attack them like a bear robbed of her cubs and tear open the rib cage over their hearts. I will devour them there like a lioness, like a wild beast that would rip them open (Hos. 13:7-8). The lion that is transformed into a man represents the first establishment of the church, in which people are regenerated into the image of God through the power of truth, signified by the lion. The second state is represented by a bear, in which the Word is read but not understood. The third state is represented by a leopard, in which the Word is falsified. The fourth state is the destruction of all good and truth in the Church. During the Babylonian captivity, the Jews withdrew from their idolatrous practices and returned to following the law of Moses. During the Medo-Persian Empire, there was a resurgence of the ancient monotheistic religion of Zoroastrianism. It was likely followed as a tradition. Likewise during this time Jews started to develop their own traditions. During the Grecian Empire, the false religion of Greek idolatry was propagated with the spread of Hellenistic culture across the Middle East. The Roman Empire invaded Palestine and destroyed the Jewish temple, and for the first three centuries attempted to suppress the spread of Christianity. This is what the prophecy means in general, now let's examine the spiritual meaning of the prophecy in more detail. This Swedenborg then proves by quoting several passages of scripture. Without revelation, man is left to his own false reasoning, and this is removed by the power of truth. 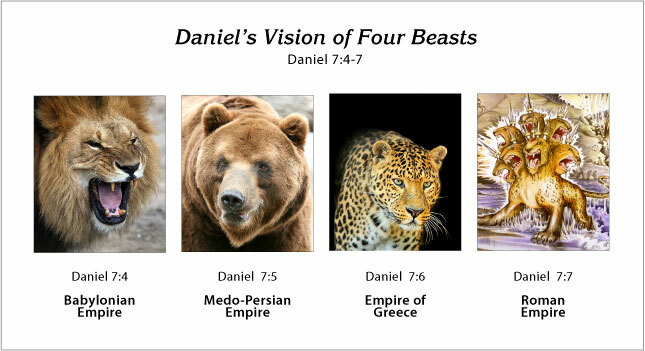 Without knowing the spiritual sense, no one can explain why eagle's wings are removed from a lion which then becomes a man, nor can anyone explain in detail what this prophecy of Daniel truly means. The rib, being a bone, signifies what is derived from the self or one's own, which Swedenborg calls "proprium." Bones signify one's own self which is dead, but flesh added to the bones signify what is living from the Lord, which is described in a vision in Ezekiel 37 where flesh is added to bones and they become living people. Thus for the bear to "devour flesh" from the ribs signifies to distort the Word in its most literal sense from one's own self understanding. "Since sensual men do not see any truth in its light, but argue and wrangle about every thing as to whether it is so, and these altercations in the hells are heard out of them as gnashings of teeth, which in themselves are the collisions of falsity and truth, it is manifest what is signified by the gnashing of teeth (Matt. viii. 12; xiii. 42, 50; xxii. 13; xxiv. 51; xxv. 30; Luke xiii. 28): and in a measure what by gnashing with the teeth (Job xvi. 9; Ps. xxxv. 16; xxxvii. 12; cxii. 10; Mic. iii. 5; Lam. ii. 16)." (Apocalypse Revealed, n. 435). Horns appear in multiple passages of scripture, and in every case a horn spiritually signifies the power of truth fighting against falsehood, or in the opposite sense the power of falsity fighting against truth. "And in their good pleasure they houghed [hamstrung] an ox. That this signifies that from depraved will they altogether weakened the external good of charity, is evident from the signification of good pleasure, as the will, here a depraved will; and from the signification of houghing, as weakening; and from the signification of an ox, as the natural or external good of charity (see n. 2180, 2566, 2781). That here an ox is spoken of, and just before a man, is because by a man is signified the truth of faith and by an ox the good of charity" (Heavenly Arcana, n. 6357). When studying prophecy, don't be deceived by all too literal interpretations of prophecies that apply them to political events. All of scripture relates to the Lord and His kingdom, and His kingdom on earth is the church. When our minds become elevated above the literal sense, the prophecy of Daniel becomes universal and applicable, and with this insight and understanding one can then discern falsehoods that put people under a blind religious faith of darkness.